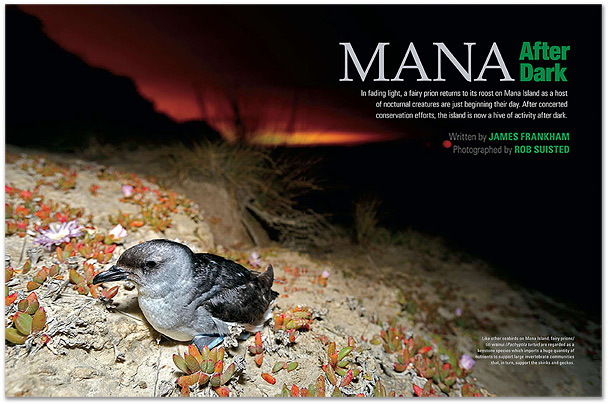 Teamed up with Editor of NZ Geographic Magazine, James Frankham, to do a feature on nocturnal Mana Island. Photography of wildlife can be tough, but doing it alone, in the dark, fitting between southerly cold fronts and short timeframes makes it all the sweeter for me when it comes off. I enjoyed this one, and working with James in a can-do style. 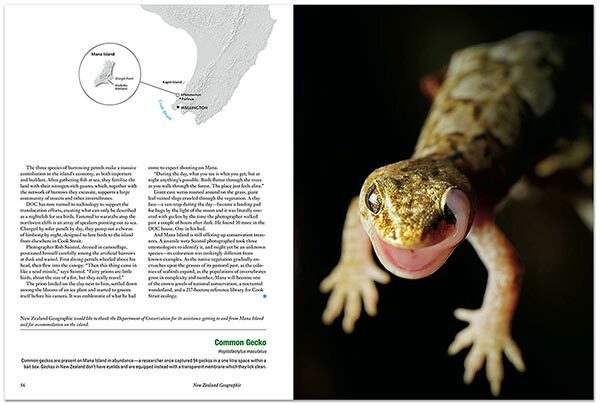 The story is contained in the 100th issue of NZ Geographic Magazine (a great milestone for James and the team). How about getting a copy as it’s a beaut read – in fact it’s so good I can’t think of a reason not to. Better still I think you should subscribe). Here are a few of the frames selected for publication and a bit of info behind them. I wanted to show rarely seen wildlife living on this special island, but contextually it’s so close to our capital city (hence I wanted the light pollution illuminating the skies beyond). The shot above was taken after sitting motionless in the dark for 2 hours in camouflage clothing waiting for the diving petrels to return to their burrows after dark. I was ready to leave when a lone bird landed nearby amongst the flowering native ice plant - what a stroke of luck. It sat there preening while I careffully took it’s portrait. ‘We’d like you to mentor a ‘Young Gun’ photographer’ was James Frankham’s request from New Zealand Geographic Magazine. The ‘Young Gun’ was Spiderman Bryce – a keen young chap from Hamilton who has a penchant for bugs, especially big spiders. Bryce was super keen, and while spiders are not one of my fav critters, I’m always up for an interesting challenge, giving back to a good cause and something different. NZ Geo magazine have just started a programme where they pair promising photographers with seasoned pros (not sure what my seasoning is yet though). We chose to take Bryce to Mana Island, a Scientific Reserve that is an island sanctuary for some of New Zealand’s rarest animals and plants. 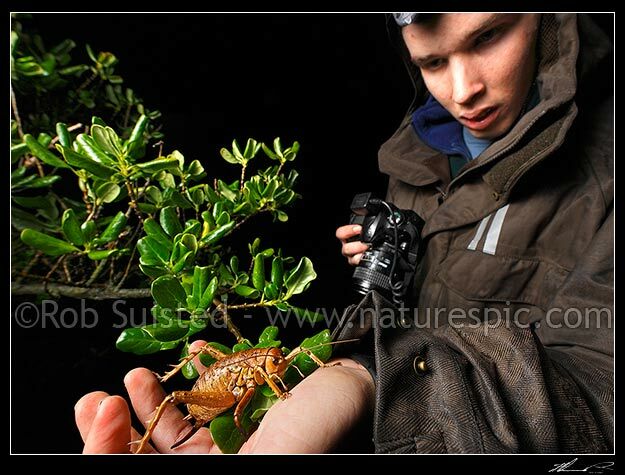 Currently Mana is being restored to a pest free island status, which means that the lack of introduced predators gives the local fauna a chance to recover – especially the giant weta and lizards. Kindly supported by the Department of Conservation (DOC), we were collected in the DOC boat and whisked across to Mana Island from Paremata. 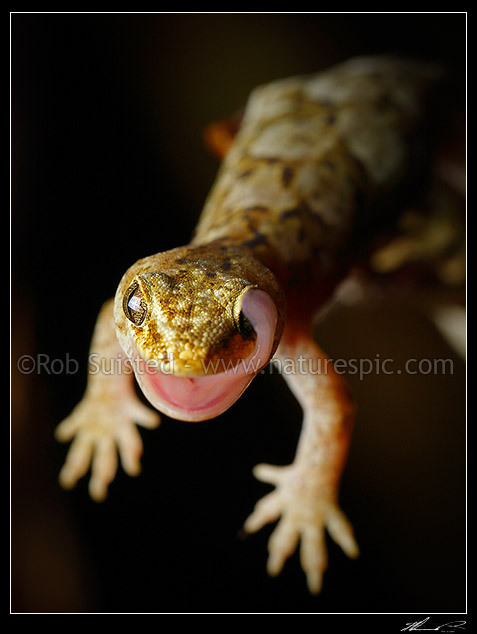 You're browsing entries tagged with Mana Island at Nature’s Pic Images Blog.